Important Made in USA Origin Disclaimer: For certain items sold by Walmart on Walmart.com, the displayed country of origin information may not be accurate or consistent with manufacturer information. For updated, accurate country of origin data, it is recommended that you rely on product packaging or manufacturer information. 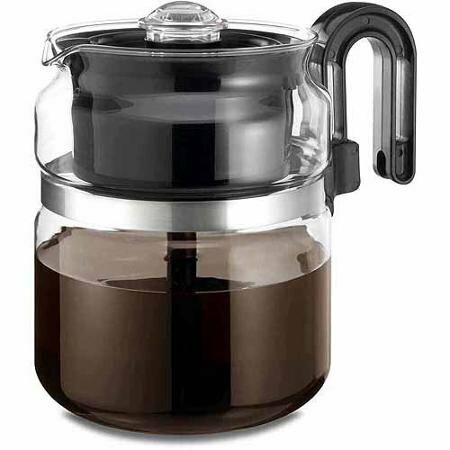 Enjoy a fresh cup of coffee in the morning with this One All Glass 8-Cup Percolator. It is constructed from lab-quality borosilicate glass with a handle that is designed to stay cool to the touch for user safety. This stain-resistant stovetop glass percolator is easy to maintain as it is dishwasher safe. The percolator includes a trivet that can be utilized on an electric coil stove. View More In Electric Coffee Percolators.